Ford Sierra RS 500 Cosworth Matchbox K162 Superkings . Toy Car job lot Lesney,Corgi,Matchbox,Hot Wheels,Husky. Please see photos for condition. 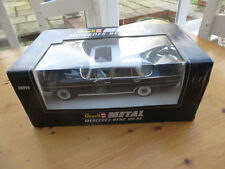 MATCHBOX LESNEY No.39a Ford Zodiac Convertible. Original vintage diecast 1957. Dark peach body, silver trim, grey plastic wheels, sea green-turquoise metal base. Very good; some chips, some highline rub CHEAP SHIPPING! UK and Worldwide shipping. We no longer ship to South America, Italy, Israel, Middle East, China, Africa. Please do not bid if you are expecting shipping to these countries/regions. MATCHBOX LESNEY No.75b Ferrari Berlinetta. Original vintage diecast 1965. Metallic green body, clear glazing, cream interior, wire wheels, black plastic tyres, bare metal base. Very good-excellent; a few tiny nibbles CHEAP SHIPPING! UK and Worldwide shipping. We no longer ship to South America, Italy, Israel, Middle East, China, Africa. Please do not bid if you are expecting shipping to these countries/regions. Matchbox Dinky - Job Lot. Play and age related wear. Matchbox King-Size Lamborghini Miura, good condition with only light paint wear as pictured. 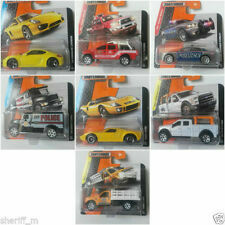 Here I have 6x Matchbox Lesney Superfast models in played with condition. 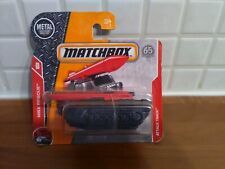 MATCHBOX LESNEY No.57b Chevrolet Impala. Original vintage diecast 1961. Blue metallic body with light blue roof, green glazing, black plastic wheels, black metal base. Playworn-fair; paint loss, chips and highline rub CHEAP SHIPPING! UK and Worldwide shipping. We no longer ship to South America, Italy, Israel, Middle East, China, Africa. Please do not bid if you are expecting shipping to these countries/regions. MATCHBOX LESNEY No.57b Chevrolet Impala. Original vintage diecast 1961. Blue metallic body with light blue roof, green glazing, silver plastic wheels, blue metal base. Good-fair; some paint loss to roof, nibbles and highline rub CHEAP SHIPPING! UK and Worldwide shipping. We no longer ship to South America, Italy, Israel, Middle East, China, Africa. Please do not bid if you are expecting shipping to these countries/regions. New listingMATCHBOX SUPERFAST 5 'LOTUS EUROPA' PINK. VINTAGE. Here we have a genuine early MATCHBOX piece. Just wait for/request an invoice! Don't worry though - I wont rip you off. If required, a sensible resolution is usually possible. Here is a small lot of 10 Land Rover's. There is Britains Matchbox Majorette ERTL etc. They are in fairly good condition. Job Lot Lesley Matchbox Cars. Condition is well Used. As you see them , please no returns. , Dispatched with Royal Mail 2nd Class. Matchbox Lesney No.67a Saladin Armoured Car RARE Type E (BOX ONLY). Condition is Used. Dispatched with Royal Mail 2nd Class. Box is good with all flaps (see pics) PLEASE NOTE YOU ARE BIDDING ON THE RARE EMPTY E-TYPE BOX ONLY, THERE IS NO CAR. 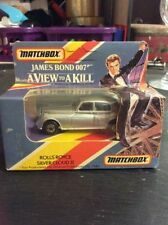 Matchbox Models of Yesteryear Collectibles Series. 1957 BMW 507 in Cream with Black Soft Top. Special Edition. This item is in excellent condition. MATCHBOX LESNEY No.32b Jaguar E Type. Original vintage diecast 1962. Metallic red body, cream interior, clear glazing, spoked wheels, black tyres, black metal base. Excellent; some small nibbles, super-detaling etc CHEAP SHIPPING! UK shipping 75p, Worldwide shipping £1.50. We will only ship TRACKED MAIL to South America, Italy, Israel, Middle East, China, Africa. Please be prepared for EXTRA SHIPPING COST OF c.£7 if you are expecting shipping to these countries/regions. Matchbox 39 Rolamatics Clipper 1973. Matchbox Rolamatics 67 Hot Rocker 1973. Matchbox 9 Superfast AMX Javelin 1972. Matchbox 62 Superfast Renault I7TL 1974. Matchbox Superfast 31 Volks-Dragon 1971. Matchbox Superfast 45 BMW 3.0CSL 1976. 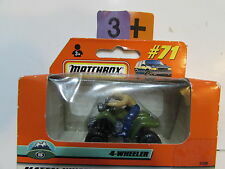 Matchbox 1-75 Number 7 in Rare Italian market box. Model is as issued by the factory in near mint original box (See pictures) i do combine shipping into one package where possible. Overseas shipping is available but more expensive. Any questions please do ask. Everything listed comes from my own personal collection of diecast models. MATCHBOX LESNEY SUPERFAST No.24c Rolls Royce Silver Shadow GOLD Original vintage 1972. Metallic gold body, Japanese issue, cream interior, clear glazing, wide Superfast wheels, enlarged arches, black metal base. Excellent; some nibbles, chips mainly to roof CHEAP SHIPPING! UK and Worldwide shipping. We no longer ship to South America, Italy, Israel, Middle East, China, Africa. Please do not bid if you are expecting shipping to these countries/regions. MATCHBOX LESNEY No.45a Vauxhall Victor. Original vintage diecast 1958. Yellow body, silver trim, without glazing, bare metal wheels, black metal base. Good-fair; a few nibbles, marks etc CHEAP SHIPPING! UK and Worldwide shipping. We no longer ship to South America, Italy, Israel, Middle East, China, Africa. Please do not bid if you are expecting shipping to these countries/regions. FOR SALE IS THIS VINTAGE JOB LOT MATCH BOX SUPERFAST 18no OUTSTANDING CONDITION. PLEASE SEE PICS. Here we have 2 Lesney #43 Hillman Minx from the 1950's. They are re-painted and only one has the tow hook. Also there is a Matchbox #23 Trailer Caravan. All are in very good condition. 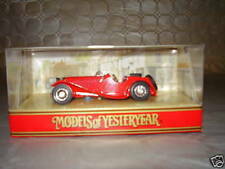 MATCHBOX LESNEY MOY Yesteryear Y6-2 1935 Type 35 Bugatti. Blue. Original vintage diecast 1961. French blue body, 6 decals, gold spoked metal wheels, black metal base. Good; some nibbles, chips etc, decals complete CHEAP SHIPPING! UK and Worldwide shipping. We no longer ship to South America, Italy, Israel, Middle East, China, Africa. Please do not bid if you are expecting shipping to these countries/regions. Moko Matchbox Lesney 70a Ford Thames Estate Car - Turquoise & Yellow - 1959 Exc. MATCHBOX LESNEY No.65a Jaguar 3.4 Litre. Original vintage diecast 1959. Blue body, blue number plate, silver grille, grey plastic wheels, black metal base. Very good; a few nibbles/marks etc CHEAP SHIPPING! UK and Worldwide shipping. We no longer ship to South America, Italy, Israel, Middle East, China, Africa. Please do not bid if you are expecting shipping to these countries/regions. Matchbox Lesney Superfast MB12 Citroen CX in Yellow - 1979. Matchbox Superfast Wheels MB-12f Citroen CX Estate car in a Yellow body colour, Red plastic interior and tow hook, clear windows, gloss Black painted base, the rear plastic hatchback door opens, the model was produced in England 1979. Matchbox Superfast No7 Volkswagen VW Golf Light Green with Surfboards 1976. Great collectable Matchbox/Supercar related set. MATCHBOX LESNEY No.39a Ford Zodiac Convertible. Original vintage diecast 1957. Pale peach body, silver trim, bare metal wheels, sea green metal base. Fair-good; some general nibbles, some highline rub CHEAP SHIPPING! UK and Worldwide shipping. We no longer ship to South America, Italy, Israel, Middle East, China, Africa. Please do not bid if you are expecting shipping to these countries/regions. Moko Matchbox Lesney 32-a Jaguar XK140- White - 1957. Matchbox Superkings K-86 VW Volkswagen Golf & Petrol Pump Mint & Boxed 1985. Matchbox Superkings K-86 Volkswagen Golf in White with a Red plastic interior and tow hook, clear windows, Red/Yellow/Orange striped body labels,White plastic Shell petrol pump, the model was produced in 1985. VINTAGE MATCHBOX LESNEY No.34 VOLKSWAGEN SPLIT SCREEN CAMPER TRIO 1962 RESTORE? UNITED KINGDOM UP TO 2 KILOS = £4.50. THIS WILL SUBSTANTIALLY KEEP THE COST DOWN FOR YOU. IF YOU HOVER THEMOUSE OVER THE PICTURE IT WILL BRING UP AN ENLARGED PICTURE WITH MORE DETAIL. GOOD LUCK! 1.5 to 2 kg = £32.99. Matchbox Lesney 62c Mercury Cougar Metallic Lime Green - Mint & Boxed 1966. 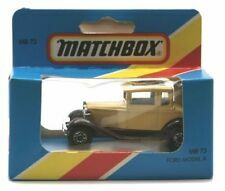 Matchbox 1-75 Number 10 in Rare Italian market box. Model is as issued by the factory in good original box due to split cellophane window (See pictures) i do combine shipping into one package where possible. Overseas shipping is available but more expensive. Any questions please do ask. Everything listed comes from my own personal collection of diecast models.